Popularly known as America’s Last Home Town or Butterfly Town USA, Pacific Grove possesses a quaint and quiet charm all its own. Pacific Grove is positioned between Pebble Beach and Monterey. Carmel-by-the-Sea is the next city, five miles to the south, and the community of Big Sur is 30 miles south. The zip code is 93950 and the telephone area code is 831. The Monterey Peninsula Airport and the Monterey Jet Center service the Pacific Grove residents. Locals who have settled here and tourist who come back year after year describe Pacific Grove as a welcoming town with charming ambiance and colorful Victorian homes dotted along the Pacific coast line. 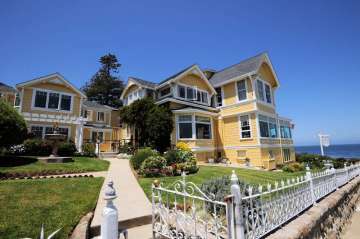 Pacific Grove is romantically remembered by couples who frequent the many special Bed & Breakfast Inns along the coastline. Citizens and families fortunate enough to live here boast an amazing quality of life and a wonderful close knit community celebrating many annual events. Local traditions include a Butterfly Parade, in which elementary school children dress in various costumes and march through town, and the Feast of Lanterns, a Chinese-styled pageant in which a high school girl and her companions act out a melodrama. If you’re fortunate enough to be in Pacific Grove during the fall or winter, you will be witness to one of nature’s most incredible spectacles: the annual migration of the Monarch butterflies. Tens of thousands of Monarchs descend on Pacific Grove in October, and take up residence in the pines and eucalyptus trees of the Monarch Grove Butterfly Sanctuary. Pacific Grove has a population of approximately 15,522 citizens, 7,316 households, and 3,972 families residing in the city. Pacific Grove has a total area of 4.0 square miles, 2.9 square miles of it is land and 1.1 square miles of it is water. Pacific Grove boasts sweeping expanse of coastline on the Monterey Bay, with many homes enjoying one-of-a-kind views, and a city-owned golf course near the bay which is regarded as one of the great golf values on the Monterey Peninsula. In addition to a variety of sizes and prices of single-family homes, a number of large condominium complexes are available in Pacific Grove. The town does not allow development on the waterside of the ocean-front street, so that the beaches and scenic points are unobstructed. Famous attractions include Asilomar, Point Pinos Lighthouse, Pacific Grove Municipal Golf Links, and Lovers Point Beach which offers reliable surfing and beautiful kayaking. Cyclists and pedestrians enjoy the coastal views along the Monterey Bay Coastal Recreation Trail. Pacific Grove was founded in 1875 by a group of Methodists, in time the butterflies, fragrant pines and fresh sea air brought others to the Pacific Grove to settle. Pacific Grove recognizes a Chinese heritage, but that was basically a “Chinatown” fishing settlement that burned down in 1906 when the land owner wanted to convert the property to oceanfront villas. “Chinatown” was at Point Alones, which now holds Stanford’s Hopkins Marine Station, next to the Monterey Bay Aquarium. Chinese fishermen who moved there in the 1850s and ‘60s built wooden shanties in a one-street village that eventually caught as much as 100 tons of squid a year, which was dried on their rooftops and racks that stretched to Lovers Point. The stong smell of squid drying was a major concern when the Pacific Improvement Company wanted to subdivide and sell the 30 acres leased to the Chinese. The tenants refused to leave. In May 1906, on a night many of the Chinese were away watching their children graduate from Pacific Grove schools, an explosive fire believed started by coal oil swept through “Chinatown” and the Pacific Grove Volunteer Fire Department found the only hose they brought to fight the fire was slashed and unusable. The next day the property owner put a fence around the area and hired guards to keep the Chinese from rebuilding. Pacific Grove’s attractions evoke a timeless air, from its historic establishments to its breathtaking slices of nature. The Pacific Grove Museum of Natural History gives children and adults insight into the ever-evolving story of the Monterey Peninsula, with both human artifacts and exhibits on the flora and fauna of the area. For a number of years, John Steinbeck lived in a cottage in Pacific Grove owned by his father, Ernest, who was Monterey County Treasurer. The cottage still stands on a quiet side street, without any plaque or special sign, virtually overlooked by most Steinbeck fans. Locals and visitors alike are privileged to enjoy dining opportunities at many spectacular local restaurants. “Sustainable” is a watchword of Pacific Grove’s restaurants, as exemplified by the award-winning Passion Fish Restaurant. Pacific Grove also offers cozy breakfast nooks, home style Italian cooking, cutting-edge European cuisine, and more. Sold on beginning your new life in Pacific Grove then contact real estate broker Nicole Truszkowski and she will help you discover the unique nine sub-communities located within Pacific Grove. Each subdivision has its explicit advantages and unique characteristics which create a real estate value specific to that location. There can be dramatic variance in pricing of homes with similar square footage and lot size based on the subdivision where the home is located.